Monument of the 7th Penna. Cav. After the Union excursion to Chattanooga in early June 1862 (in which the 79th Pennsylvania played a central role), Confederate General Nathan Bedford Forrest was sent to the area to organize cavalry to disrupt Union operations in the area. In mid-July, Forrest's new command became active, striking Union cavalry detachments--including the 7th Pennsylvania Cavalry--and taking them by surprise in an engagement known as the First Battle of Murfreesboro. 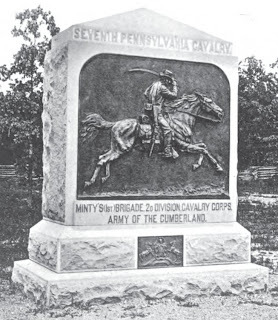 As the Confederate raid on Murfreesboro put Forrest's cavalry halfway between Nashville and the 79th Pennsylvania, it caused significant concern and sparked rumors in Lancaster. Guerrilla forces also started acting up around this time, murdering Capt. T. H. Reynolds, sutler of the 78th Pennsylvania, in an ambush. The 79th Pennsylvania continued camping and guard duties around Shelbyville, Tennessee, as Union troops began to build up in the area. They guarded bridges, built forts, and played a minor role in the reactions to various emergencies in the region. Various rumors reached Lancaster, including the wholesale capture of the 79th Pennsylvania, and updates from the regiments' soldiers correspondents (reprinted below) had the additional role of dismissing wild rumors. Increased Confederate aggressiveness in this region foreshadowed a Confederate invasion of Kentucky that would shape the rest of the year. Confederate commander Gen. Braxton Bragg began assembling his forces around Chattanooga and temporarily turned the war's tide in the Western Theater as he struck north for Kentucky. The Union army, including the 79th Pennsylvania, followed and played a key role in the culminating event of Bragg's invasion, the Battle of Perryville, on October 8, 1862.